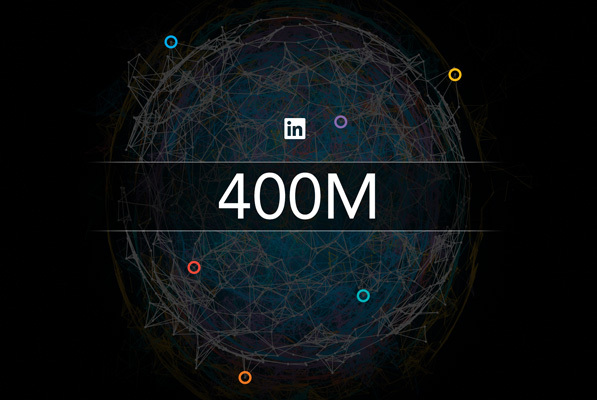 We’re excited to announce that the LinkedIn network has grown to 400 million members around the world. Our vision at LinkedIn is to create economic opportunity for every member of the 3.3 billion strong global workforce. To realize this vision, we’re creating the world’s first economic graph by digitally mapping the global economy, identifying the connections between people, jobs, companies, skills, schools, and knowledge. You, our members, make up the core of the economic graph, and play an important role in bringing this vision to life. Every day, we’re inspired by members like you. We’ve seen you make billions of connections this past year alone, and leverage these connections to start companies, inspire the next generation of leaders, even change the world for good. To share your rich knowledge and experiences, more than 1 million members have published long form posts and 19.7 million+ SlideShares have been uploaded. And 40% of LinkedIn members are using mobile to look for new jobs - with many landing their dream jobs and achieving their career aspirations through LinkedIn. Thank you for inspiring us as we continue to create new and better ways to help you connect to the people, knowledge and opportunities that matter most to you.